At the San Francisco Dungeon due to our restriction with our wheelchair user lifts we are at times unable to admit electronic wheelchairs to a weight and width restriction. The wheelchair and person must weigh under 600 pounds (330kg) and the chair cannot extend the width of 27 inches. Also due to narrow passages and doorways within the San Francisco Dungeon care givers operating electronic wheelchairs may find they are unable to navigate through certain areas, for more information please call our toll-free number. Electronic wheelchairs must be able to navigate through tight bends at an angle. 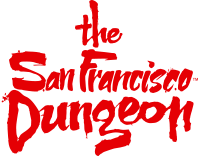 The San Francisco Dungeon does use dark lighting throughout the experience and due to the nature of the attraction there is uneven flooring such as cobbles which will need to be navigated through.